Paul Romer has taken another swipe at economics [pdf] -- this time at macroeconomics. His previous discussion of mathiness was directed at growth economics, and I wrote about it several times (e.g. here). In his latest, Romer compares macroeconomics to string theory (in a bad way). I'm not sure he quite understands what string theory is (in a way that reminds me of his misunderstanding the Bohr model) so I don't think his analogy supports his argument. Update + 2 hours: I am not addressing Romer's problems with macro, with which I largely agree! As I mentioned in the PS below, there is a forthcoming post on that. This post is just about the macroeconomics-string theory analogy (or really any physics analogy) that should be retired. Macroeconomics is its own thing and really not like physics in any way. Even the analogy with thermodynamics fails because the economic version doesn't have a second law. Economics is a very different complex system. Update 15 September 2016: I have a second post that has more description of how I personally viewed string theory when I was in academic physics. The post below is mostly about technical failures of the analogy. The linked post is more about the sociological failures of the analogy. Update 16 September 2016: Here's another way to look at the Venn diagram below in terms of equations. Second, and on a more personal level (and speaking of string theory), from the outside, the whole DSGE model discussion reminds me of how String Theory is seen in physics: awesome models, awesome mathematics, little connection to experiment, pretty much intractable except with various simplifying assumptions, and kind of a big deal for a limited reason (DSGE has microfoundations and can look like an economy, string theory has something that looks like what we think quantum gravity should look like). First, let me say that both Smith and Romer cite Lee Smolin on the subject. This is a bit like citing John Cochrane or Robert Lucas on Keynesian economics. 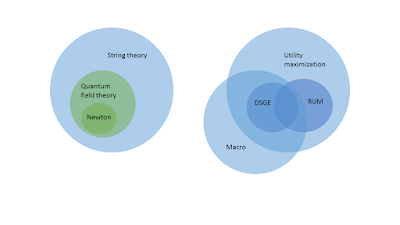 Smolin develops and advocates a "competing" theory of quantum gravity (loop quantum gravity). I have to say that this is the Smolin of 2006 (when his book came out); at one time, he seemed amenable to the idea that loops and stings are different representations of the same thing. Not sure what the change was -- possibly just frustration with the limited uptake of loops (which may yet win out in the end). I personally just see loops as part of the general philosophy in physics that every theory could be an effective theory -- an easier version of some other theory under some limited scope -- as long as they have the same symmetries. For example, with the AdS/CFT correspondence, we could look at the (hard to calculate) strongly coupled regime of an approximately conformal theory like QCD as a perturbative (i.e. easy to calculate) supergravity on AdS₅. 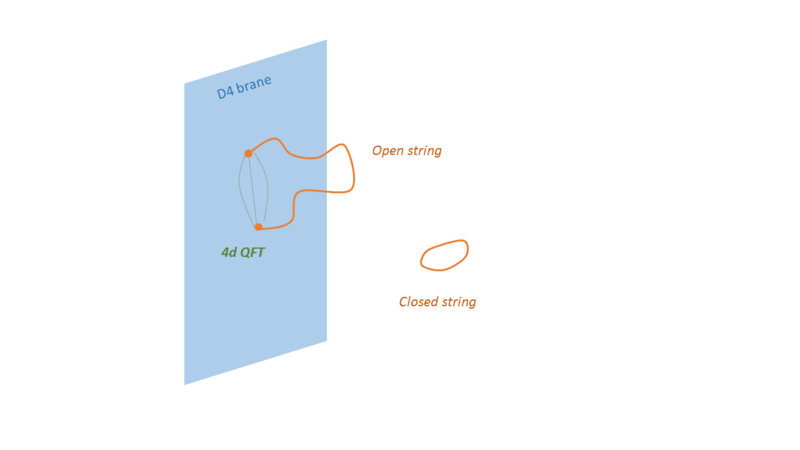 This is the heart of the AdS/CFT correspondence above: the 2d brane (really 4d) is the boundary of the 3d (really 5d) volume (the "bulk") where the string/supergravity theory applies. String theory contains quantum field theories and quantum field theories are the basis of the successful standard model. Now if DSGE macro was like string theory, it would be untestable in the domain it is supposed to address (at least realistically) and would contain some other fantastically successful theory as a limit. We'd have to live in a world where you couldn't measure GDP or inflation to test DSGE models, but DSGE described individual human economic behavior to many decimal places. Obviously this isn't true. Additionally, the utility maximization framework (and its rational counterpart RUM) is not where a lot of the empirical success of economics is. Behavioral economics tells us that humans are not often rational. The macro theories that appear to have given the best understanding of the world after 2008 have come from the area of macro outside the utility maximizing circle (e.g. IS-LM). The economics profession is not in disrepute. Macroeconomics is in disrepute. The micro stuff that people like myself and most of us do has contributed tremendously and continues to contribute. But the DSGE models are purportedly based on that microeconomics! That the microeconomics fails to aggregate into a plausible macro theory means there is something wrong with the microeconomics. A root cause analysis of the fruitlessness of DSGE macro points to micro. Non-microfounded models like IS-LM or econometric (e.g. VAR) models aren't in the same boat as DSGE macro. In contrast, the root cause of the fruitlessness of string theory is the lack of experiments turning up results for string theory to explain. But that can't propagate back into questioning quantum field theory in the same way macro failures must result from some micro failure. Going back to the Venn diagram above, an issue inside the string theory circle does not imply an issue in the QFT circle. However an issue inside the DSGE circle does imply an error in every circle DSGE is embedded. Romer also uses Smolin's charge that strings are like a religion or politics as opposed to science. I don't really buy it, but if strings are a religion, may all religions be like it! String theory makes no claims about things that are feasibly testable and in the areas where it is testable it says the same things as well established science. Imagine if Christians only made claims about stuff that happens near the Planck scale! The thing is that if DSGE macro is "religious", then its fundamental tenets (microeconomics and the utility maximizing approach) are the source of its doctrine. That is to say "religion" infects all of economics. Singling out on macro is like blaming Presbyterians for all of the ridiculous claims of monotheism. As a final note, let me say that a lot of the public view of string theory (and therefore economists' view) seems to be stuck in the 1990s. Even Smolin's book, which came out in 2006 seems to negate the progress. The string theory of the early 90s is very different from the string theory of today. Much like how T-duality was a major advance, "holographic duality" will probably be seen as a major advance. We may never have experiments that probe the string scale, but I'm pretty sure that we will eventually construct a string theory that contains the entire standard model. Just because we haven't found it yet doesn't mean it doesn't exist. I imagine that theory will have several different descriptions (even an entropic one). PS I plan on doing a second post addressing the more macro-relevant claims Romer makes. I think you missed the point of Romer's argument. He wasn't discussing the science of string theory, he was discussing the sociology of the science of string theory. The sociology is intimately connected to the view of the science. If strings are bad science, then the reason to pursue is sociological. But strings aren't bad science in the same way macro is, so the reason to pursue is scientific. Basically Smolin's claims about string theory are accurate of macro, but not accurate of string theory. It is the main organizing analogy of Romer's paper, so I don't think pointing out the "sociological" problems with string theory are incorrect misses the point. b) making the string theory analogy misses that the real problem is all of economics, not just macro. Even Romer is guilty but uses the string theory analogy to focus on others. In Romer's story, he is Smolin and Lucas is, say, Ed Witten. This is a terrible analogy. That's why I wanted to counter the string theory analogy; it leads in the wrong direction. There is no analogy offered between string theory and macroeconomics. Romer's analogy is between the behaviour of string theorists and the behaviour of macroeconomists as scientists. You obviously are very defensive of string theory for some reason and had to jump at a perceived sleight. Or perhaps you just don't think economists are capable of commentary on matters related to physical science. Perhaps physical scientists should take care in treading into the ground of economics. "Romer's analogy is between the behaviour of string theorists and the behaviour of macroeconomists as scientists." My point is that this behavior analogy is flawed because of the underlying science (or lack thereof in the case of macro). The interpretation of behavior is critically dependent on the state of the science. Let's say Smolin is a crackpot with his loop quantum gravity theory. That string theory ignored his approach is not some kind of cult-like behavior, but rather perfectly understandable. In that view Romer is asking: why doesn't macro listen to crackpots? This is an exaggeration to make my point: in the macro case, the crackpots appear to dominate the field and Romer himself is part of the crackpottery but thinks it's other people that are crackpots. The focus ends up on DSGE (the result of applied crackpottery) rather than utility maximization (the fundamental crackpottery). It's true that I am also against the false narrative about string theory not being "science", whether it is spread by physicists or economists. "My point is that this behavior analogy is flawed because of the underlying science (or lack thereof in the case of macro)." That's the point Romer is sort of making but he's saying that because of the behaviour of economists not because of the nature of their theories. "The interpretation of behavior is critically dependent on the state of the science. " Crazy point. Behaviour is behaviour. It is dependent on the observation of the behaviour not on the state of the science. You don't, won't, get it. Reply fail -- see below. Crazy point. Behaviour is behaviour. That is really an odd way to look at it. Behavior is critically dependent on context; remove the context and there is no way to interpret the behavior. Someone studying astrology by reading books and working through the math of figuring out the locations of the planets on a specific day is a crackpot. And when they shun people with new astrological ideas (such as planets don't have influence over our destiny), that's cult-like behavior. Someone studying astronomy and working through Newton's laws to figure out the orbits of the planets is not a crackpot. And when they shun people who bring in new ideas like being able to violate the speed of light, they are being scientific. The behavior is superficially the same. The interpretation is dependent on the state of the science (astrology vs astonomy). Is this the same "anonymous" that thought he knew better than Einstein what Einstein thought? If so that would shed a lot of light on this exchange. Firstly, how do you know if the planets influence behaviour or not? I'm not saying they do or they don't. For you, the astrologer qua astrologer is immediately a crackpot. Perhaps you're the crackpot. "The behavior is superficially the same." The behaviour is exactly the same. The only difference is that we look back from our perspective, knowing how the science has unfolded. The irony is that Newton himself was an astrologer and an alchemist, and so in your terms, a crackpot.